Due to customer requests, a smaller version of the Original Edition angel pet cremation urn was created. The same renowned sculptor who crafted our patented Original Edition pet urns also created the smaller, Original Edition II. The same striking characteristics and details found in the "Original" pet urn are also present in the smaller version. These cat and dog urns come with your choice of two photo frames: Scalloped or Oval. 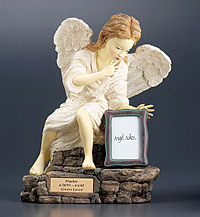 Each fits wonderfully underneath the angel's hand and holds a 2" x 2-1/2" picture of your pet. Original Edition II pet memorial urns are cast in designer resin and are available in four finishes: Bronze Patina, Hand Painted, Marble and Stone. Each is also personalized with a solid brass nameplate bearing an inscription of your choosing. The inscription may be one, two or three lines. We provide a choice of nameplate colors: Gold Bright Brass, Blue Marbleized, Brown Marbleized or Green Marbleized. Visit the Personalization Page to view actual nameplate colors and inscription styles. 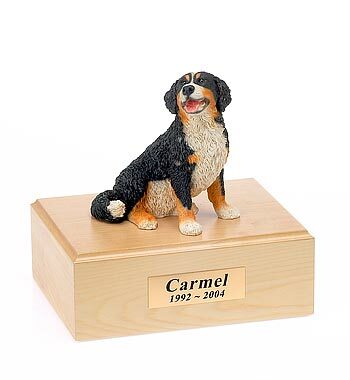 An Original Edition II pet memorial is approximately 11-1/4" tall, 9" wide and 6-1/2" deep and will accommodate a pet up to 30 pounds.